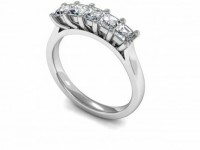 ET147 eternity ring w five princess shape diamonds set in white gold. “Lilac” is a beautiful eternity ring with five princess shape diamonds set in white gold. This scintillating ring may be made in whatever size stones you choose and can also be made in platinum, yellow gold or rose gold.